Using Reel Blue Aqua Sealer - Spray once lightly over the desired area, let dry and then spray lightly again. Two times total is all that is needed. Avoid buld up. Use a hair dryer to accelerate drying if necessary. This sheet contains: Island Arm Bands, 'Bad Girl' w/dbl. 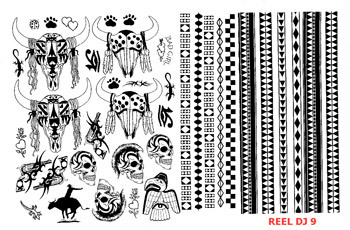 Hearts and Arrow, Native American Thunder Bird, Tribal Skull, Egyptian Eye, Lizard, Tribal Revolvers, Paw Prints, Lady Bug, Double Hearts , Native American Steer Skull. Sold by the sheet only.